Rosetta’s mission to comet 67P/Churyumov-Gerasimanko is coming to an end – plans are already in place for a grand finale on September 30, when the orbiter will land gracefully (erm, crash) on the surface of the target it has been following so closely for more than two years. In preparation for the landing, Rosetta has been approaching ever closer to the surface. High resolution images of the surface have been returned, showing in great detail the stark and pitted landscape, ragged cliffs and boulder-strewn plains. But what is that, under that rock – could it be? Could it possibly be? 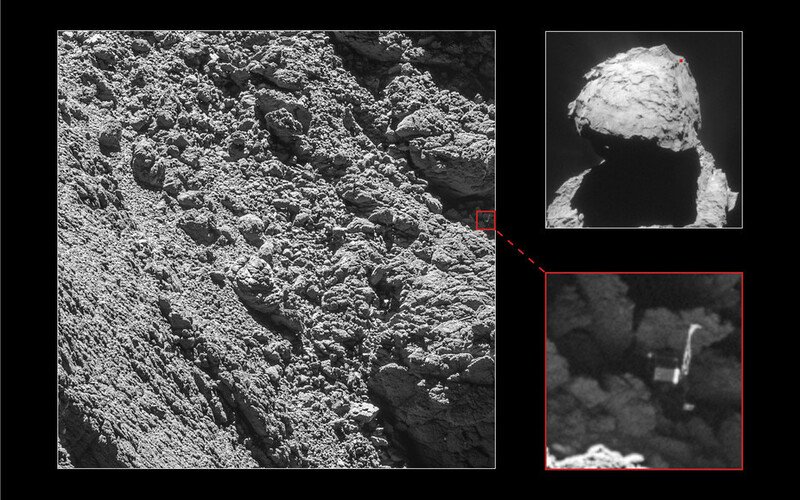 It is – it’s Philae! The lost comet lander was identified in images taken by Rosetta’s OSIRIS camera on September 2, from a height of only 2.7km above the surface. It was emotional for me to see the lander sheltering below a cliff, thinking back to the last sight we had of it, in freefall towards the surface of 67P. There have been several false alarms, with unusually shaped or shadowed rocks thought to be Philae, but the new identification is very clear – “unequivocal”, in the words of the European Space Agency. Philae was delivered to the comet on November 12 2014, but bounced on landing, settling a short (but significant) distance away from its designated landing site. Philae returned data from its instruments for 60 hours until its main batteries died. It was thought, at the time, that Philae had landed on its side, under an overhang, preventing its secondary, solar-powered batteries to be recharged. In June and July 2015, when the comet had moved much closer to the sun, Philae made sporadic contact with Rosetta, suggesting that a communications antenna had been damaged. Now, we can see that the supposition was correct – Philae is on its side, wedged underneath an overhanging cliff in the Abydos region of the comet. It is, of course, great to see the lander that produced so much interesting data in its shortened active lifetime. But why has so much effort been put in to trying to find Philae ? There is no chance that any of its instruments could be operational – the comet is too far away from the sun to power them, which is why the Rosetta mission is coming to an end. The reason is that we can now put the acquired data into context. The MUPUS team , in charge of a multipurpose sensor package on board Philae, will be able to identify which rock its penetrator hammered into, giving the team a much clearer idea of which part of the surface was so hard. 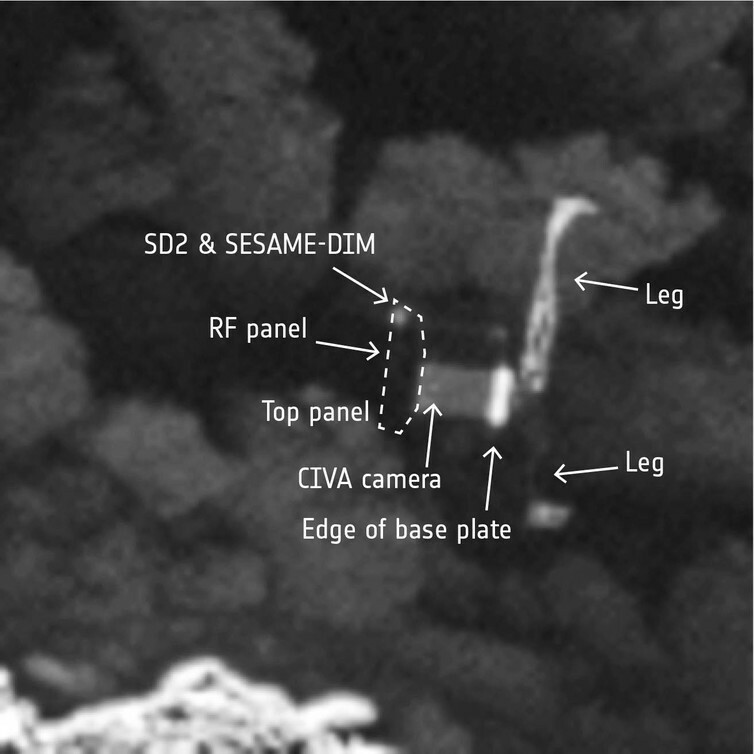 Now that we know where Philae is, images from cameras on the lander can be orientated relative to images from Rosetta by matching surface features that the two sets of images have in common. The surface of the comet has been mapped, by an instrument on Rosetta, into areas with different composition, based on how light is reflected from the comet’s surface. By looking in more detail at the structure of Philae’s landing site, the compositional data can be corrected, taking into account the shape of the landscape. This will enable a better idea of the composition of the rocks around Philae, which in turn will help interpret data from the other instruments. One particular instrument team may be rejoicing more loudly than others. CONSERT (Comet Nucleus Sounding Experiment by Radiowave Transmission) was designed to analyse radio waves that bounced between Rosetta and Philae, to determine the interior structure of 67P. The team has been liaising with the imaging teams to search for Philae, as the data they had could help locate Philae to within an area of a few square metres. Now, in combination with the close-up pictures, the location has been tied down precisely. This is surely a great relief to the CONSERT team, because without knowing exactly where Philae landed, their data could not be interpreted fully. Now they know where Philae is, they can go ahead and gain a more accurate determination of the comet’s interior . The CONSERT should be able to derive something that is almost like a CT scan of 67P, identifying small structural variations in the interior of the comet. We might even be able to find out how well the two lobes of the comet are joined together – and if they might break apart again. Although it is not currently planned to land Rosetta close to Philae, there will be a few more opportunities to take images from even closer over the remaining time of the mission. Philae was gone, but not forgotten. Now that we know the lander’s final resting place, we can picture it in eternal hibernation circling the sun for the lifetime of its cometary ride.